The Amish Traditional 4-Door Pantry provides additional storage for your busy kitchen while enhancing the decor with a beautiful solid wood design. You choose the wood and finish that best reflects your personal style and our gifted Amish craftsmen do the rest. With the kitchen being the center of activity on a daily basis, this Amish pantry makes a great addition. There's room for food, beverages, dishes and linens in this grand Amish pantry. Consolidate your most needed items with plenty of room to spare. Your Amish Traditional 4-Door Pantry is handcrafted to meet your specific needs. Choose four spacious, adjustable shelves in this Amish pantry or take one out and select two bottom or center drawers for storage. Consider our Amish Tilt Out Trash Bin with Towel Bar to complement this Amish pantry. Oak: The most widely used hardwood in American furniture making, oak is celebrated for its strength, durability and beauty. Brown Maple: A more economical choice when compared with Cherry, Brown Maple displays a dark stain beautifully, making it ideal for contrasting pieces. Cherry: Recognized for its strength and beauty, the heartwood has a fine, straight, closed grain and a smooth, rich texture. Quarter Sawn White Oak: Known for its amazing strength and firm texture. 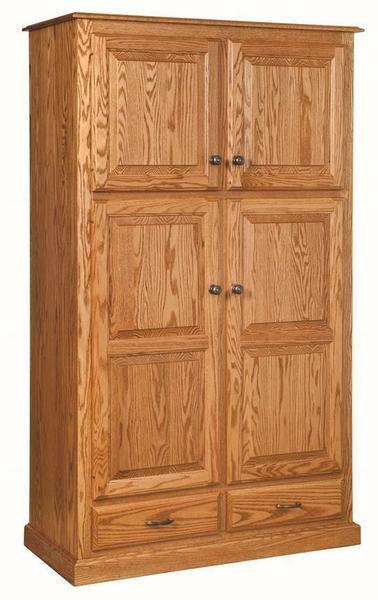 Add an Amish Traditional 4-Door Pantry to your kitchen collection today for only 30% down. Call one of our Amish Furniture Specialists today at 1-866-272-6773 with any questions.